本发明实施例提供了一种数据处理方法及设备。 Embodiment of the present invention provides a data processing method and apparatus. 对于发送端来说，所述数据处理方法包括：获取待处理数据，以及待处理数据的信道编码方式；根据信道编码方式，以及预先建立的信道编码方式与调制方式的对应关系确定待处理数据的调制方式；根据信道编码方式对待处理数据进行编码处理，以及根据确定的调制方式对待处理数据进行调制处理；按照固定的符号速率发送对待处理数据进行编码和调制后的处理结果。 For the transmitting end, the said data processing method comprising: acquiring data to be processed, and the channel coding scheme data to be processed; determining data to be processed according to a corresponding relation between the channel coding scheme and channel coding scheme and the modulation scheme of a pre-established modulation; treat process according to a channel coding scheme to encode data processing, and processing data to be processed is modulated according to the determined modulation mode; transmission data to be processed is processed result of coding and modulation according to a fixed symbol rate. 通过利用本发明所提供的方案，可有效降低发送端处理数据的复杂度，同时减少接收端识别编码过程的检测量，且降低复杂度。 By using the embodiment of the present invention is provided, which can effectively reduce the complexity of processing data transmitting side, the receiving end while reducing the amount of detected identification code process, and reduce complexity. 本发明设及通信技术领域，特别是设及一种数据处理方法及设备。  and provided the present invention field of communication technologies, and in particular is provided a data processing method and apparatus. 在EGPRS2巧nhancedGPRS地ase2,增强的通用分组无线业务阶段二）中， Level-A和Level-B的业务会采用不同的符号速率进行发送，其中Level-A采用NSR(Normal SymbolRate,普通符号速率），具体的为270. 833化ps，Level-B使用服R(Hi曲erSymbol Rate,高符号速率），具体的为325化ps，其中服R是NSR的1. 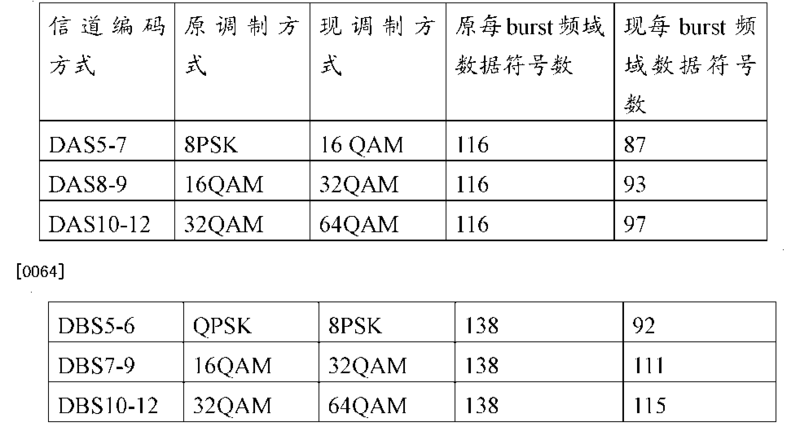 2倍。  In EGPRS2 clever nhancedGPRS to ASE2, an enhanced general packet radio service phase II), Level-A and Level-B traffic will use different symbol rates for transmission, wherein the Level-A using NSR (Normal SymbolRate, general symbol rate), particularly for 270.833 of ps, Level-B using service R (the Hi song erSymbol rate, high symbol rate), particularly of the PS 325, where R is 1.2 times serving the NSR. 在EGPRS2中，信道编码方式与调制方式、速率等具有对应关系。  In EGPRS2, the channel coding scheme and modulation scheme, and the like having rate correspondence relationship. 在数据处理过程中，发送端根据当前信道状况选择信道编码方式对待处理数据进行编码，并选择所述对应关系中的调制方式对编码后数据进行调制后，按照相应速率发送给接收端。 In the data processing, the transmitting end according to the current channel condition to select a channel coding scheme to encode data to be processed, and selecting the correspondence relationship after the modulation scheme of modulated encoded data, transmitted to the receiving end in accordance with a respective rate. 接收端接收到发送端发送的处理结果后，如图1所示，将其分别通过不同的调制方式和速率组合的判别， 得到相应的判别结果后，利用预设的判别规则对判别结果进行分析处理，确定出所述处理结果的调制方式和速率，然后进行SB识别和(PS识别W确定出所述处理结果的信道编码方式。 After receiving end receives the processing result transmitted from the transmitting side, as shown in FIG respectively through different combinations of modulation scheme and rate discrimination, to give a corresponding determination result, the determination by using a preset rule discriminant analysis results process, determine the rate and modulation scheme of the processing result, and then identify SB (PS identification W channel coding scheme is determined that the processing result. 化icsson在3GPPGERAN#45 会议提出了PCE2(PrecodedEGPRS2)技术，通过在调制端引入离散傅里叶逆变换IDFT，接收端引入离散傅里叶变化DFT操作将EGPRS时域信号变换成频域。  In icsson 3GPPGERAN # 45 of the meeting is proposed PCE2 (PrecodedEGPRS2) technique, by introducing Inverse Discrete Fourier Transform IDFT modulation side, DFT Discrete Fourier transform operation receiving end of the introduction transform EGPRS time domain signals into the frequency domain . 但是，在PCE2中仍然沿用了原EGPRS2中的不同符号速率和其编码方式及调制方式的对应关系，对于发送端，不同的发送速率对应不同的符号数，对不同长度的符号数进行处理会引入不同长度的IDFT模块，W及其他不同突发burst结构的处理过程，此时会增加实现的复杂度；而对于接收端来说，由于调制方式和速率的组合方式存在多种（如图1 所示为6种），需要同时进行较多种判别，也导致识别编码的过程检测量较大且较复杂。 However, in the PCE2 are still used in different symbol rates and corresponding relationship between the original EGPRS2 in which coding and modulation schemes for the transmission side, different transmission rates correspond to different symbols, for symbols of different lengths is performed will be introduced into the process IDFT module different length, W, and other various processes sudden burst structures, this time will increase the complexity of implementation; and for the receiving side, because there are many combinations of modulation scheme and rate (as a into six shown), it is determined more than required, but also result in a detectable amount of process identification code larger and more complicated. 按照所述固定的符号速率发送对所述待处理数据进行编码和调制后的处理结果。  accordance with the fixed symbol rate of said transmitted coded data to be processed and the processing result modulated. 利用所述调制方式对所述处理结果进行解调。  The modulation method using the processing result demodulated. 发送模块，用于按照所述固定的符号速率发送对所述待处理数据进行编码和调制后的处理结果。  transmitting means for transmitting the encoded data to be processed and the processing result of said modulated according to a fixed symbol rate. 解调模块，用于利用所述调制方式对所述处理结果进行解调。  demodulating means for demodulating the processing result using the modulation scheme. 本发明实施例中，预先建立，为实现待发送数据对应处理结果按照固定的符号速率进行发送的，信道编码方式与调制类型的对应关系。  The embodiments of the present invention, pre-established, corresponding to data to be transmitted to achieve the results of the processing, channel coding scheme and modulation type a fixed correspondence relationship between the transmitted symbol rate. 当对待处理数据进行编码和调制时， 发送端根据信道状况确定所述待处理数据的信道编码方式，从预先建立的信道编码方式与调制方式的对应关系中，确定与所述信道编码方式对应的调制方式，并利用所确定信道编码方式和调制方式对所述待处理数据进行编码和调制，进而按照固定的符号速率发送相应处理结果，从而可有效降低发送端处理数据的复杂度；进一步的，对于接收端，接收具有固定的符号速率的处理结果，无需对所述处理结果的符号速率进行盲检测，减少了识别编码过程的检测量，且降低了复杂度。 Channel coding scheme when data to be processed for encoding and modulating the transmitting end according to the channel condition is determined that the data to be processed, from the corresponding relationship between channel coding scheme pre-established modulation scheme, determining the channel coding scheme corresponding to the modulation, and using the determined channel coding scheme and the modulation scheme of the data to be processed is coded and modulated, in turn sends a corresponding processing result according to a fixed symbol rate, which can effectively reduce the complexity of the transmitting side processing data; further, the processing result of the receiving terminal, receives a fixed symbol rate, the symbol rate is no need to perform a blind detection processing result, to reduce the amount of the identification code detection process, and reduces the complexity. 为了更清楚地说明本发明实施例或现有技术中的技术方案，下面将对实施例或现有技术描述中所需要使用的附图作简单的介绍，显而易见地，下面描述中的附图仅仅是本发明的一些实施例，对于本领域普通技术人员来讲，在不付出创造性劳动性的前提下，还可W根据该些附图获得其他的附图。  In order to more clearly illustrate the technical solutions in the embodiments or the prior art embodiment of the present invention, a brief Apparently, the drawings in the following description or embodiments as described in the prior art needed to be used in describing the embodiments the drawings are only some embodiments of the present invention, those of ordinary skill in the art is concerned, without any creative effort, and W may derive other drawings from the accompanying drawings in accordance with the plurality. 图8为本发明实施例所提供的数据处理系统的结构示意图。  Figure 8 a schematic view of the structure of a data processing system according to embodiments of the present invention is provided. 下面将结合本发明实施例中的附图，对本发明实施例中的技术方案进行清楚、完整地描述，显然，所描述的实施例仅是本发明一部分实施例，而不是全部的实施例。  below in conjunction with the present invention in the accompanying drawings, technical solutions of embodiments of the present invention are clearly and completely described, obviously, the described embodiments are merely part of embodiments of the present invention, but not all embodiments example. 基于本发明中的实施例，本领域普通技术人员在没有做出创造性劳动前提下所获得的所有其他实施例，都属于本发明保护的范围。 Based on the embodiments of the present invention, all other embodiments of ordinary skill in the art without any creative effort shall fall within the scope of the present invention. PCE2技术中将原时域信号的处理变换到频域，使得调制阶数的提升对解调复杂度和性能的影响大大减小，从而给编码和调制的设计带来了更大的灵活性。  PCE2 art processing original domain signal into the frequency domain, so that the influence of the modulation order to enhance the demodulation performance and complexity is greatly reduced, leading to a greater coding and modulation design flexibility. 现有在PCE2技术中有16种信道编码方式，每一种信道编码方式都对应一种调制方式，而按照该信道编码方式和调制方式处理后的数据对应两种不同的符号速率。 There are in the prior art PCE2 of 16 channel coding scheme, each channel corresponds to one modulation coding mode and in accordance with the data channel coding scheme and modulation processing corresponding to two different symbol rates. 对于发送端，不同的符号速率对应不同的符号数，对不同长度的符号数进行处理会引入不同长度的离散傅里叶逆变换IDFT 模块，W及不同burst结构的处理过程，此时会增加实现的复杂度。 For the transmission side, different symbol rates corresponding to different symbols, the number of symbols of different lengths is inverse discrete Fourier transform IDFT module, W, and the process of handling different burst structures introduce different length, this time will increase to achieve complexity. 例如；信道编码方式DBS-5对应的调制方式为QPSK，编码和调制后的处理结果按照高符号速率HSR进行发送。 For example; channel coding scheme DBS-5 corresponding to the modulation scheme is QPSK, the processing result after coding and modulation in accordance with a high symbol rate transmitted HSR. 其中，现有PCE2 的burst中包括TS(TrainingSequence)、CP(切clicPrefix)、GP(Guard Period)和D(数据符号）几个部分。 Wherein, burst existing PCE2 included in TS (TrainingSequence), CP (cut clicPrefix), GP (Guard Period) and D (data symbols) several parts. NSR下burst总符号数要满足156. 25,作为示例，NSR 下总burst符号数对应的各部分符号数的具体组成可W为；N_NSR= 58*2+26+6+8. 25 = 156. 25,其中，TS字符数为26,CP和GP的符号数分别为6和8. 25,数据符号数为116。 NSR the total number of symbols to meet burst 156.25, by way of example, a specific number of constituent portions of the NSR total number of symbols corresponding to the symbol burst may be W is; N_NSR = 58 * 2 + 26 + 6 + 8 25 = 156.. 25, wherein, the TS number of characters is 26, the number of symbols CP and GP 6 and 8.25, respectively, for the number of data symbols 116. 而服R下burst总符号数为187. 5,作为示例，服R下总burst符号数对应的各部分符号数的具体组成可W为；N_HSR= 69*2+31+8+10. 5 = 187. 5,其中，TS字符数为31，CP和GP的符号数分别为8和10. 5,数据符号数为138。 The total number of symbols of the burst 187.5 R serving as an example, a specific number of constituent portions of the total number of symbol burst symbol corresponding to the service may be W is R; N_HSR = 69 * 2 + 31 + 8 + 10 5 =. 187.5, where, the TS number of characters is 31, the number of symbols CP and GP 8 and 10.5, respectively, the number of data symbols 138. 可W理解的是，在burst组成中TS、CP、GP的符号数和数据符号数可W根据不同的情况或编码和调制发生变化，但只要所有组成部分符号数之和满足NSR总符号数，则按照NSR发送；而所有组成部分符号数之和满足HSR符号数， 则按照HSR发送。 It may be W appreciated that the number of symbols and the data symbols in the burst composed of the TS, CP, GP may W change depending on the circumstances or the coding and modulation, as long as all components of the symbols of the number of and meet the total number of symbols the NSR, the NSR according to the transmission; and the sum of all components of symbols and satisfy HSR symbols, is sent in accordance with HSR. 需要说明的是，现有EGPRS2的下行信道编码包含USF(化linkStateFlag)的编码、头化eader)的编码、业务数据信息值ata)的编码、PANfiggy-backedAck/P'Jack)的编码和SB(StealingBits,也可W写作SFstealingFlag,偷比特）的编码。 Coding  Incidentally, the conventional EGPRS2 downlink channel coding comprises encoding the USF (of linkStateFlag), the head of eader) encoding service data information values ​​ATA) is, PANfiggy-backedAck / P'Jack) encoding and SB (StealingBits, W can also be written SFstealingFlag, stealing bits) coding. 后续说明书中的信道编码指的是包含各部分编码的信道编码总称。 Channel coding the subsequent description refers to a general term channel coding comprises coding each portion. 其中SB的编码是通过一定长度的码字来区分信道编码源信息中头数据的类型，即化aderType。 Wherein SB is coded to distinguish between types of channel coding the source information data header, i.e. of aderType by a length of a codeword. 由于目前一种化aderType仅对应一种头的编码方式，该就意味着SB本质是用来区分不同的头编码方式的。 As the current corresponding to only one kind of encoding aderType way head, which means that SB is used to distinguish the nature of the first coding method. 如果相同的HeaderType采用了不同的编码方式，那么也需要不同的SB码字来区分。 If the same HeaderType using different coding, it also requires a different codewords distinguished SB. 为简单起见，后续说明书部分SB也可写作对应不同的HeaderType。 For simplicity, the subsequent description part may also be written SB different corresponding HeaderType. CPS(Codingand化nearingScheme indicatorfield)是头信息中的一个组成部分，用来指示信道编码和打孔方式。 CPS (Codingand of nearingScheme indicatorfield) is an integral part of the header information to indicate channel coding and puncturing manner. [00川通过判断出的信道编码方式，分别对USF、化ta和PAN进行相应的译码，从而获取所有的有用信息。 [00 Sichuan judged by the channel coding scheme, the USF respectively, of the corresponding PAN ta and decoded so as to obtain all the useful information. 由上述可知，PCE2技术中，对于接收端，编码方式识别过程包括；调制方式和速率盲检测。  From the foregoing, PCE2 art, for the receiving side, the encoding process includes identification; blind detection rate and modulation scheme. 如图1所示，当调制方式和发送速率存在六种组合时巧PSK化rNSR;QPSK化r 服R;16QAMforNSR;16QAMfor服R;32QAMforNSR;32QAMfor服时，所W在进行调制方式和速率盲检测时，接收端会将接收的处理结果同时进行上述六种组合的判别，根据判别结果确定出调制方式和速率，并进行相应解调，后续再根据SB识别和(PS识别判断出发送端采用的信道编码方式，最终对解调后的数据进行解码，得到发送端发送的有效数据信息。 上述信道编码方式的识别过程需要同时对符号速率和调制方式进行盲检测，由于调制方式并不限于现有的几种调制方式（如可W引入新的64QAM调制等），符号速率与调制方式组合存在较多种类，该样导致接收端识别编码的过程，检测量大且较复杂。 1, when there are six combinations of modulation schemes and clever PSK transmission rate of rNSR; QPSK service of r R; 16QAMforNSR; 16QAMfor clothes R; 32QAMforNSR; when 32QAMfor service, the W during blind detection rate and modulation scheme when the receiving end the received processing result will simultaneously determines the six combinations of the above, modulation scheme and a rate is determined according to the judgment, and the corresponding demodulated, and then judged according to the subsequent identification and SB (PS identified using the transmitting end a channel coding scheme, ultimately decode the demodulated data to obtain valid data information sent by a transmitter. identification process of the above channel coding scheme for symbol rate and the need to perform a blind detection of modulation, since the modulation method is not limited to existing several modulation scheme (e.g., W may introduce new 64QAM modulation, etc. ), there are more species in combination with the modulation symbol rate, the sample causing the receiver to process identification code, detected large and complicated. 本发明实施例所提供的数据处理方法中，发送端通过采取具有特定对应关系的信道编码方式和调制方式对待处理数据进行信道编码和调制，从而W固定的符号速率发送待处理数据对应的处理结果，W此降低发送端处理数据过程中的复杂度；同时，对于接收端， 由于接收的处理结果具有固定的符号速率，所W进行编码识别时，无需对所述处理结果进行速率盲检测，该样有效减少了接收端编码识别过程中检测量，降低复杂度。  The embodiment of the present invention is a data processing method embodiment provided, the transmit end by taking channel coding scheme and the modulation scheme having a certain correspondence relationship between data to be processed channel coding and modulation, so that W fixed symbol rate of the transmission data to be processed corresponding to processing result, W reduce the complexity of this data transmission end treatment process; At the same time, for the receiving side, since the received processing result has a fixed symbol rate, W is the code recognition, the processing result without a blind rate detection, which reduce the sample receiving end detection encoding identification process, reduce complexity. 本发明实施例并不限定上述各组成部分的符号个数，W下实施例仅是在特定TS、 CP和GP长度下的示例。 Example  The present invention is not limited to the number of symbols of the components of the above, the embodiments are merely exemplary W at a specific TS, CP, and the length of the GP. 下面W特定TS、CP和GP长度下，将发送端的符号速率统一到普通符号速率NSR为例，即；将burst的数据符号数统一为116,对本发明实施例所提供的数据处理方法进行介绍。  Here W particular the TS, the CP and GP length, the transmission side symbol rate uniform to a normal symbol rate NSR example, that; the burst of the number of data symbols unified 116, a data processing method embodiment provided by the present invention introduced. 由于在固定的burst时间段内，符号速率直接由burst内的符号数目来决定，因此可W 将符号速率的统一简化为burst内符号数目的统一。 Since fixed burst period, a symbol rate is directly determined by the number of symbols in the burst, so W can be unified to simplify the burst symbol rate is the number of unified symbols. 可W理解的是，也可W将发送端的符号速率统一到高符号速率服R，即；将每burst的数据符号数统一为138。 W can be understood that W can be sent to the end of the high symbol rate symbol rate service unified R, that is; the number of symbols for each data burst 138 is unified. 本实施例中的发送端可W为基站子系统BSS，基站子系统BSS包括；基站收发信机BTS和基站控制器BSC，基站收发信机BTS从基站控制器BSC获得待处理数据和信道编码方式，然后对待处理数据进行信道编码和调制处理。  transmitting end in the present embodiment is the embodiment W may be a base station subsystem (BSS), BSS comprises a base station subsystem; base transceiver station BTS and the BSC station controller, the base transceiver station BTS from the BSC to obtain data to be processed and the base station controller a channel coding scheme, data to be processed and then performs channel coding and modulation. ，同样也可W为基站。 , W may also be a base station. 步骤S24,按照固定的符号速率发送对待处理数据进行编码和调制后的处理结果。  Step S24, the transmission data to be processed is processed result of coding and modulation according to a fixed symbol rate. 需要说明的是，上述编码调制后的数据还可W经过离散傅里叶逆变换IDFT、增加CP、脉冲成形等处理。  It should be noted that the data may be coded and modulated through the inverse discrete Fourier transform W IDFT, increase CP, pulse shaping and other processing. 进一步的，上述实施例中，预先建立为保证所述待处理数据对应处理结果按照固定的符号速率进行发送的信道编码方式与调制方式的对应关系中的信道编码方式所对应的调制方式为比现有信道编码方式与调制方式的对应关系中信道编码方式所对应的调制方式阶数高的调制方式。  Further, the above-described embodiment, the pre-established to ensure that the data to be processed corresponding to the processing result of modulation channel coding scheme corresponding relationship between the channel coding scheme and modulation scheme transmitted in the corresponding according to a fixed symbol rate order higher than the conventional channel coding scheme and modulation scheme corresponding relationship between the channel coding scheme corresponding to the modulation scheme of the modulation scheme. 需要说明的是，上述表1中，符号速率为将实际符号速率W普通符号速率归一后的结果。  Incidentally, in Table 1, the actual symbol rate of the symbol rate of W result of a common symbol rate normalized. 该里的DAS和DBS表示的是一种特定的信道编码过程，包含了前面所描述的Header,Data,USF，SB，PAN该些所有部分编码的过程。 The representation in the DAS and DBS is a specific channel coding process, comprising the previously described Header, Data, USF, SB, PAN all the plurality of partial encoding process. 其中，D指示的是下行信道，A和B 分别指示level-A和level-B的业务。 Wherein, D indicates the downlink channel, A and B, respectively, indicating that the service level-A, and the level-B. 由表1可W看出，对于调制方式QPSK来说，比QPSK调制方式阶数高的调制方式可W为8PSK;对于调制方式8PSK来说，比调制方式8PSK调制阶数高的调制方式为16QAM。  W can be seen from Table 1, QPSK modulation scheme, a higher order than QPSK modulation scheme is 8PSK modulation scheme may be W; 8PSK modulation scheme, the 8PSK modulation scheme than the modulation order of the modulation way to 16QAM. 可W理解的是，比现有的调制方式阶数高的调制方式可根据实际情况确定，并不局限于某一种特定的调制方式，例如：比QPSK调制方式阶数高的调制方式可W为8PSK，还可W为16QAM。 W can be appreciated that higher order than a conventional modulation scheme can be determined according to the modulation scheme to the actual situation, is not limited to a particular kind of modulation, for example: higher than QPSK modulation order modulation scheme may be W as 8PSK, also W is 16QAM. 对待处理数据，利用信道编码方式和比现有信道编码方式与调制方式的对应关系中信道编码方式所对应的调制方式阶数高的调制方式进行编码和调制后得到的处理结果， 相对于利用现有的信道编码方式与调制方式进行编码和调制后得到的处理结果，每burst 的频域数据符号数减少，从而实现保证经过编码和调制后的处理结果符合固定的符号速率NSR的发送条件。 Processing result after encoding and modulating the  data to be processed, using a channel coding scheme and the ratio of the conventional channel coding scheme and the corresponding relationship between the modulation scheme of channel coding manner corresponding to the modulation scheme of high order modulation scheme obtained, the relative processing result after coding and modulation in use of existing channel coding scheme and modulation scheme obtained, the number of data symbols per burst frequency domain is reduced, thereby realizing ensure processed result of coding and modulation conform to transmit a fixed symbol rate of the NSR condition. 如表2所示，W编码方式DBS-12为例，预先建立的为保证所述待处理数据对应处理结果按照固定的符号速率进行发送的信道编码方式与调制方式的对应关系中，信道编码方式DBS-12对应的调制方式为64QAM，利用该对应关系中的信道编码方式和调制方式进行编码和调制后，处理结果中每burst数据符号数限制在116W内，从而表明该处理结果可W 利用固定的符号速率NSR进行发送。  As shown in Table, W encoding DBS-12 Example 2, in order to ensure the pre-established data to be processed corresponding to the processing results corresponding relationship between channel coding and modulation scheme transmitted according to a fixed symbol rate, channel coding scheme DBS-12 corresponding to the modulation scheme is 64QAM, the coding and modulation with channel coding and modulation mode of the corresponding relationship, the processing result of each burst of data symbols limited to 116W, thereby indicating that the processing result may W using a fixed symbol rate NSR transmitted. 当处理结果中的数据符号数小于116时，例如处理后的结果为111，相对于116还节省了5个数据符号数，对于节省的数据符号数可W采用W下方式进行调整；保持子载波个数不变，将节省的5个数据符号数用来增加保护边带，保护边带上的子载波个数可W填0,即空子载波，该里可W称为padding填充符号，其长度用L表示。 When the number of data symbols processing result is less than 116, for example, the results of treatment of 111 with respect to 116 also saves five data symbols, to the number of saved data symbols W a W under way adjustment; holding subcarriers the same number, will save the five data symbols used to increase the protection zone, with the number of sub-carrier sideband protection may be filled W 0, i.e. null subcarriers in the padding may be referred to as a fill symbol W, the length He is represented by L. 当发送端W固定的符号速率NSR发送处理结果时，可W通过调整L的大小，W使得处理结果满足NSR速率的发送条件，即在特定TS、CP和GP长度下，将处理结果中每burst数据符号数调整达到116。 When the sending end of the W fixed symbol rate NSR transmitting the processing result, may be W by L resizing, W so that the processing result transmission condition NSR rate is satisfied, i.e. at a specific TS, CP and GP length, the processing result of each burst adjustment for achieving the number of data symbols 116. 可W理解的是，表2所示的对应关系仅仅是示例，并不构成对本发明的限制。  W can be appreciated that the correspondence relationship shown in Table 2 are merely examples and do not limit the present invention. 需要说明的是，由于在特定TS、CP和GP长度下，将处理结果中每burst数据符号数调整达到116,即可满足按照固定的符号速率发送的条件。  Incidentally, since the specific TS, CP length and GP, the processing result of each data burst symbol adjustments to reach 116, to satisfy the condition transmitted according to a fixed symbol rate. 因此，也可W根据实际情况调整TS、CP和GP的字符数长度，W满足处理结果能够按照固定符号速率进行发送的条件。 Thus, W can also be adjusted according to actual situation TS, the number of characters of the length of the CP and GP, W meet the condition processing result can be transmitted according to a fixed symbol rate. 由于每burst中数据符号数实际上是由信道编码的输出信息量来决定，所W也可W在TS、CP和GP字符数不变的情况下，在利用上述阶数高的调制方式进行调制的基础上， 通过修改编码输出信息量，将每burst的数据符号数调整为116,满足W普通符号速率NSR 发送处理结果的条件。  Since the number of data symbols per burst is determined by actually outputting the channel encoded information amount, W may be the case where W is TS, CP and GP same characters, using the high-order modulation on the basis of modulated manner, by modifying the encoded output information, the number of data symbols of each burst is adjusted to 116, general condition W NSR transmitted symbol rate processing result is satisfied. 因此，在建立信道编码方式和调制方式的对应关系时，从改变信道编码输出信息量的角度考虑，采用高冗余编码方式，高冗余编码方式为；对待处理数据编码后得到的输出信息量高于按照现有信道编码方式与调制方式的对应关系中的信道编码方式编码后的输出信息量的信道编码方式。 Thus, when the correspondence relation between the channel coding scheme and modulation scheme, to change the channel coding from the viewpoint of the output information, high redundancy coding mode, the coding mode is the high redundancy; treating postprocessing data encoded output information obtained higher than the channel coding scheme in accordance with the output information of the channel coding scheme corresponding relationship existing channel coding scheme and the modulation scheme in the coding. 发送端按照上述高冗余信道编码方式进行编码后得到的数据，在利用阶数高的调制方式进行调制后，其处理结果中每burst的数据符号数为116,则可实现将处理结果按照固定的符号速率NSR发送的目的。 Transmitting the encoded side data obtained by the above highly redundant channel coding scheme, the modulated high-order modulation scheme using data symbols per burst as a result of the processing 116, the processing result can be achieved according to a fixed the purpose of the transmitted symbol rate NSR. 如表3所示，需要说明的是，考虑到信道交织，该里信道编码后的信息比特需利用4个burst来承载。  As shown in Table 3, to be noted that, taking into account the channel interleaving the information bits in channel coding using four required to carry the burst. 由于原信道编码方式DBS-5W服R发送，每burst数据符号数为138， 采用的是QPSK调制，因此编码后的信息比特为138*2*4 = 1104个比特，其中2为QPSK调制每符号承载的比特数目。 Since the original channel coding scheme DBS-5W clothes R transmission, each burst number of data symbols 138, using QPSK modulation, the information bits after coding is 138 * 2 * 4 = 1104 bits, where 2 is the QPSK modulation per symbol the number of bits carried. 为了保证处理后的结果能够WNSR发送，则每burst数据符号数需要减小到116个，考虑到信道编码的性能，该里可W采用阶数高的调制方式承载编码后的数据，例如选取8PSK作为阶数高的调制方式，那么编码后的数据变为116*3*4 = 1392 比特，其中3为8PSK调制每符号承载的比特数目。 In order to ensure that the results after treatment can WNSR transmission, each burst of data symbols need to be reduced to 116, taking into account the channel coding performance, the inside may be W using data of high order modulation scheme to carry the coded, for example, select 8PSK a high-order modulation scheme, the encoded data becomes 116 * 3 * 4 = 1392 bits, where 3 is the number of bits per symbol, 8PSK modulation bearer. 对于信道编码方式DBS-5,其编码后的数据为1104个比特，为了将对待处理数据进行编码后得到的信息比特数增加为1392,此处采用调整DBS-5的方式，使其具有更高的冗余，通过更高的冗余，实现将编码后的信息比特数增加为1392,可将该种调整后的，具有更高冗余的信道编码方式称为DBS-5a。 For channel coding scheme DBS-5, after which the encoded data of 1104 bits, the number of information bits to encode the data to be treated is increased to 1392 obtain, DBS-5 is used here to adjust the way, it has a higher redundancy, by higher redundancy, to increase the number of bits to achieve the encoded information 1392, may be adjusted after the species, channel coding scheme having a higher redundancy is referred DBS-5a. 对于其他的编码方式W此类推。 W push for such other encoding. 在性能满足要求的情况下，新信道编码方式对应的调制方式也可W选择其他的方式，编码后的比特数根据期望得到的每burst内数据符号数目和选择的调制方式中每符号承载的比特数计算得到。  In the case of performance to meet the requirements of the new channel coding scheme corresponding to the modulation scheme may be W Alternative approaches, the number of data symbols per burst within the number of bits encoded in accordance with the desired resulting modulation scheme selected for each symbol calculated to obtain the number of bits carried. 如，针对原DBS-5的业务，若期望WNSR发送，并选择16QAM调制承载，那么编码后的比特数为116*4*4 = 1856,则需采取可将待处理数据编码后比特数满足为1856的新的信道编码方式。 As for the original business of DBS-5, if desired WNSR transmission, and selects 16QAM modulation carrier, then the number of coded bits is 116 * 4 * 4 = 1856, may need to be taken to handle the data coded bits to satisfy the new channel coding scheme 1856. 可W理解的是，表3所示的对应关系仅仅是示例，并不能构成对本发明的限制。  W can be appreciated that the correspondence relationship shown in Table 3 are merely exemplary, and should not be construed as limiting the present invention. 参见表4,W原DBS-5的业务为例，若期望发送速率为NSR，并选择仍WQPSK承载， 那么编码后的比特数必须为116*2*4 = 928比特，将待处理数据进行编码后得到928比特的新的编码称为DBS-化。  Table 4, DBS-5 to W is the original service as an example, if the desired transmission rate of the NSR, and select the still WQPSK bearer, then the number of bits after encoding must be 116 * 2 * 4 = 928 bits, to be processed data obtained by coding the new coding of 928 bits called DBS-. 相比原编码后的1104比特而言，新的信道编码方式的冗余度降低了，可W称为低冗余的编码。 1104 compared to the original encoded bits, the redundancy of the new channel coding scheme is reduced, may be referred to as W low redundancy coding. 随着编码技术的不断发展和演进，新的编码技术可W在低冗余的情况下满足性能需求。 With the continuous development and evolution of encoding technology, the new coding technology can meet performance requirements W at low redundancy. 可W理解的是，表4所示的对应关系仅仅是示例，并不能构成对本发明的限制。  W can be appreciated that the correspondence relationship shown in Table 4 are merely exemplary, and should not be construed as limiting the present invention. 设定所述待处理数据信道编码中的偷比特SB的值为预先为所述信道编码方式中对应的头编码方式分配的预设值。  stealing bits SB is set to be the processing of data in the channel coding for the first pre-assigned value of the encoding in the channel coding scheme corresponding to a preset value. 所述SB值用于接收端对解调后的数据进行头编码方式的判别。  SB discrimination value for the receiving end the demodulated first data coding scheme. 上述两组编码方式分别对应的相同的调制方式、分别对应一种headertype种类， 所W仍然可W采用现有的SB值的设定方式，利用原有的SB值来标识headertype。  The same modulation coding scheme corresponding to each of the two groups respectively corresponding to one kind headertype type, the W W can still use the conventional manner set value SB, SB using the original values ​​to identify headertype. 而对于DAS-8、DAS-9、DBS-7、DBS-8、DBS-9 ;该些编码方式对应相同的调制方式， 但是分别对应S种headertype化eadertype4、headertype7、headertypes);此时现有技术中8位全0和8位全1两种SB值无法区分出S种headertype,所W需要为其分配新的SB值，W区分不同种类的headertype;所述SB值可W为S种8位二进制码。  For the DAS-8, DAS-9, DBS-7, DBS-8, DBS-9; the plurality of encoding corresponding to the same modulation scheme but are S species headertype of eadertype4 correspond, headertype7, headertypes); this when the prior art and in the first 8 bits 0 1 8 full value can not distinguish two kinds SB S species headertype, W is required to assign new values ​​SB, W distinguish between different types of headertype; W is the value may SB S species 8-bit binary code. 对于DAS-10、DAS-11、DAS-12、DBS-10、DBS-11、DBS-12，其与DAS-8、DAS-9、 DBS-7、DBS-8、DBS-9的情况相似，上述编码方式对应相同的调制方式，但是对应4种header type化eadertypelO、headertype5、headertypes、headertype9)，此时按照上述思想， SB值为四种8位二进制码。  For the DAS-10, DAS-11, DAS-12, DBS-10, DBS-11, DBS-12, which DAS-8, DAS-9, DBS-7, DBS-8, DBS-9 of a similar situation, the coding mode corresponding to the same modulation scheme, but the corresponding four kinds of header type eadertypelO, headertype5, headertypes, headertype9), this case is four kinds of 8-bit binary code in accordance with the above idea, SB. 在实际应用中，为了使所设置的SB值具有一定的容错性，保证处理后的数据在信道中传输后即便因为干扰发生了变化，仍然可W通过将其判别为与其最接近的SB值的方式，确定其SB值，所W需要保证同种调制方式下的SB值各个码之间具有近似相等且尽可能大的汉明距离。  In practice, in order to set the value of SB has certain fault tolerance, to ensure that the processed data has changed since the interference even in the transmission channel, W can still be determined by their closest SB mode value, to determine the value of SB, W is necessary to ensure approximately equal and as large a Hamming distance between the SB value in each code modulation isotype. 如表5中所示，为信道编码方式所设置的S种用于区分headertype的SB值中任意两个的汉明距离为5或6,且不同信道编码的SB的值放置在burst中统一的位置。  As shown in Table 5, S is the provided channel coding scheme for the seed value SB headertype distinguish any two Hamming distance is 5 or 6, and the value of SB is different channel coding placed burst unified position. SB编码值与信道编码类型的对应关系并不限于表5中的示例，如0,0,0,0,0,0,0,0的58编码也可W对应到DAS-8 和DAS-9，0，0，0，1，1，1，1，1 的SB编码可W对应到DBS-7 和DBS-8 ; 1，1， !，0,0,0,1，1的SB编码可W对应到DBS-9。 SB coding and channel coding type value letter correspondence relationship is not limited to the example in Table 5, the 58 encoding 0,0,0,0,0,0,0,0 W may correspond to the DAS-8, and DAS-9 , 0,0,0,1,1,1,1,1 encoding the SB correspond to the DBS-7 W and DBS-8; 1,1,, 0,0,0,1,1 encoding the SB! W corresponds to DBS-9. 如表6中，为信道编码方式所设置的四种用于区分headertype的SB值中任意两个的汉明距离为5或6。  As shown in Table 6, four kinds of channel coding scheme for the set value of SB headertype distinguish any two Hamming distance is 5 or 6. 可W理解的是，所述SB值的设定不局限于表5和表6所示，只要满足各个SB值之间具有近似相等且尽可能大的汉明距离即可。  W can be appreciated, the setting value is not limited to the SB shown in Tables 5 and 6, having approximately equal and as large a Hamming distance can be as long as between the respective value SB. 同样的，SB编码值与信道编码类型的对应关系并不限于表5中的示例，如的SB编码可W对应到DAS-10 1， 1，1，1，1的SB编码可W对应到DAS-11和DAS-12 ; 1，1，1，0，0，0，1，1的SB编码可W对应到DBS-10 ;1，1，1，1，1，1，0,0 的SB编码可W对应到DBS-11 和DBS-12。 Similarly, the channel coding and the code value SB type of letter correspondence relationship is not limited to the example in Table 5, as the encoding W SB correspond to DAS-10 1, 1,1,1,1, SB correspond to DAS encoding W 11 and DAS-12; 1,1,1,0,0,0,1,1, SB correspond to the encoding W DBS-10; SB 1,1,1,1,1,1,0,0 of W may correspond to the encoding DBS-11 and DBS-12. 步骤S33、利用所述调制方式对所述处理结果进行解调。  step S33, the modulation mode by using the results of the processing to demodulate. 通过调制方式盲检测判别出所接收到的处理结果的调制方式，根据所述调制方式对所述处理结果进行解调，依据所述调制方式W及解调后的数据确定所述处理结果的信道编码方式。  determines the modulation scheme by the modulation mode blind detection processing result received, demodulating the modulation based on the processing result, the processing result is determined based on the data modulation and demodulation W the channel coding scheme. 然后接收端按照确定的信道编码方式对解调后的数据进行解码，得到发送端发送的有效数据信息。 Then the receiving end decodes the demodulated data according to the determined channel coding scheme to obtain valid data information sent by a transmitter. 由于所接收到的处理结果的符号速率固定，所W只需按照该符号速率对调制方式进行盲检测。  Since the symbol rate of the received processing result is fixed, only W of the blind detection of modulation schemes in accordance with the symbol rate. 对于利用固定的符号速率发送的处理结果来说，接收端进行调制方式盲检测所确定出的调制方式为4种；8PSK、16QAM、32QAM、64QAM;所W此时将所述处理结果分别进行4种调制方式的判别，得到4个判别结果。 For using a fixed symbol rate processing result transmitted, the receiving end detects a blind modulation scheme determined by the modulation scheme into four types; 8PSK, 16QAM, 32QAM, 64QAM; W In this case the result of the process 4 were determining modulation schemes, to obtain four determination results. 步骤S42,利用预设的判别准则，对所述流程结果进行分析处理，确定所述处理结果的调制方式。  step S42, using a predetermined criterion, the results of flow analysis and processing, the modulation mode of the processing result. [010引其中，所述判别规则为现有技术，如最大信噪比准则，且可根据实际情况确定，在此不作介绍。 [Wherein lead 010, the rule is determined prior art, such as maximum SNR criterion, and may be determined according to the actual situation, it is not described herein. 接收端根据预设的信道编码方式和调制方式的对应关系，根据所述处理结果携带的SB的值，确定出处理结果对应的headertype,然后进行CPS识别。  The receiving end of a preset correspondence relationship between the channel coding scheme and modulation scheme based on the result of processing value SB is carried, it is determined that the processing result corresponding headertype, then CPS recognition. 可W理解的是，由于信道存在一定干扰，处理结果中所设置的SB可能受到信道干扰导致码值发生变化，在进行判别时，将SB值确定为预设关系中最接近的SB值，进而确定出对应的headertype。  W can be appreciated that, due to the presence of certain interfering channel, SB processing result provided by the channel interference may cause a change in the code value, determined during the SB preset relationship value is determined as the closest SB value, and then determine the corresponding headertype. 步骤S56,对解调后的数据进行(PS识别，W确定处理结果的编码方式。  step S56, the data of the demodulated (PS identification, W determination processing result of encoding. 可W理解的是，通过判断出的信道编码方式，分别对USF、化ta和PAN进行相应的译码，从而获取所有的有用数据信息。  W can be appreciated that, the USF respectively, of the PAN ta and corresponding decoding is judged by the channel coding scheme, so as to obtain all the useful data information. 通过W上的方法实施例的描述，所属领域的技术人员可W清楚地了解到本发明可借助软件加必需的通用硬件平台的方式来实现，当然也可W通过硬件，但很多情况下前者是更佳的实施方式。 Description of  W is carried out by methods, those skilled in the art can understand that the present invention W may be implemented by software plus a necessary universal hardware platform, of course, W may be implemented by hardware, but in many cases the former is a better embodiment. 基于该样的理解，本发明的技术方案本质上或者说对现有技术做出贡献的部分可软件产品的形式体现出来，该计算机软件产品存储在一个存储介质中，包括若干指令用W使得一台计算机设备（可W是个人计算机，服务器，或者网络设备等）执行本发明各个实施例所述方法的全部或部分步骤。 Based on this kind of understanding, the technical solutions of the present invention per se or in the form of a software product may be part contributing to the prior art embodied, the computer software product is stored in a storage medium and includes several instructions that enable a with W a computer device (W may be a personal computer, a server, or network device) all or part of steps of the methods of performing various embodiments of the present invention. 而前述的存储介质包括；只读存储器(ROM)、随机存取存储器（RAM)、磁碟或者光盘等各种可W存储程序代码的介质。 The storage medium includes; W may be any medium that store program codes read only memory (ROM), a random access memory (RAM), magnetic disk, or optical disk. 发送模块64,用于按照所述固定的符号速率发送对所述待处理数据进行编码和调制后的处理结果。  transmitting module 64 for transmitting data to be processed to the processing result of the coding and modulation according to a fixed symbol rate. SB值设定单元，用于设定所述待处理数据信道编码中的SB值为预先为所述信道编码方式对应的头编码类型headertype分配的预设值。  SB value setting means for setting the channel coding data to be processed in the SB header is preset coding type headertype previously assigned to the corresponding channel coding scheme. 其中，编码调制模块63通过SB值设定单元为所述编码方式对应的headertype 分配预设值时，当所述预先建立的信道编码方式与调制方式的对应关系中，一种调制方式对应多种headertype时，分别为每一种headertype分配一个不同的SB值。  wherein the corresponding modulation and coding module 63 for coding by the value setting means when SB headertype assigned the preset value, when the correspondence relationship between the channel coding scheme and the modulation scheme of pre-established, a modulation scheme when the corresponding plurality headertype, headertype are each assigned a different value SB. [012引更进一步的，为了使所设置的SB值具有一定的容错性，SB值设定模块分别为每一种headertype分配的不同的SB值之间满足预设汉明距离。 [012 cited further, in order to make the set value SB has certain fault tolerance, the value SB satisfies the preset setting module are the Hamming distance between each of the different values ​​SB headertype distribution. 设定SB值分别为；1，1，0,0，1，0,0,0、0,0,0，1，0，1，1，0、1，1，1，1，1，1，1，1。  values ​​of the set SB; 1,1,0,0,1,0,0,0,0,0,0,1,0,1,1,0,1,1,1,1, 1,1,1,1. 当所述预先建立的信道编码方式与调制方式的对应关系中，一种调制方式对应四种headertype时，SB值设定单元设定SB值分别为；0,0,0，1，0，1，1，0、1，1，1，1，1，1，1，1、 1，1，〇,〇,1，〇,〇,〇、〇,0,1，〇,〇,〇,〇,1。 When  When the corresponding relationship between channel coding scheme and the modulation scheme of pre-established, a modulation scheme corresponding to four headertype, SB SB value setting unit sets the value, respectively; 0,0,0,1, 0,1,1,0,1,1,1,1,1,1,1,1, 1,1, square, square, 1, square, square, square, square, 0,1, square, square, billion, billion, 1. 本实施例中的数据处理设备可W为基站子系统BSS或者是基站。  The data processing apparatus in the embodiment W may be a base station subsystem BSS or base station. 本实施例公开的数据处理设备中各个模块的具体工作过程请参考上述与发送端对应的方法实施例，在此不再寶述。  The specific working process of the present data processing apparatus disclosed in each module and the above-described embodiments refer to a method of transmitting end corresponding to the embodiment, which is not described treasure. 解调模块73,用于利用所述调制方式对所述处理结果进行解调。  demodulation module 73, configured to demodulate the processing result using the modulation scheme. 调制方式确定单元722,用于利用预设的判别准则，对所述流程结果进行分析处理，确定所述处理结果的调制方式。  the modulation scheme determination unit 722, for utilizing a predetermined criterion, the results of flow analysis and processing, the modulation mode of the processing result. 本实施例公开的数据处理设备还用于，依据所述调制方式W及解调后的数据确定所述处理结果的信道编码方式，然后接收端按照确定的信道编码方式对解调后的数据进行解码，得到发送端发送的有效数据信息。  The data processing apparatus of the present embodiment is also disclosed for determining a channel coding scheme according to the processing result of the data modulation and demodulation W, and a receiving end in accordance with the determined channel coding scheme of the demodulated the data is decoded to obtain valid data information sent by a transmitter. 对应上一实施例，本实施例中的数据处理设备为终端。  an embodiment corresponding to the embodiment, the present embodiment of the data processing device is a terminal. 本实施例公开的数据处理设备中各个模块的具体工作过程请参考上述与接收端对应的方法实施例，在此不再寶述。  This specific working process of the data processing apparatus disclosed in each module and the above-described embodiments refer to a method of receiving a corresponding end of an embodiment, which is not described treasure. 终端82用于，接收网络侧按照固定的符号速率发送的处理结果，依据所述固定的符号速率，通过调制方式盲检测判别出所述接收到的处理结果的调制方式。  82 for the terminal, the network side receives the processing result transmitted according to a fixed symbol rate, according to a fixed symbol rate, the modulation scheme by the modulation scheme discriminated blind detection processing result of the received. 本实施例中的网络侧可W为基站子系统BSS或者是基站。  Examples of the present embodiment may be a network side W of a base station or a base station subsystem BSS. [014引对于装置或系统实施例而言，由于其基本相应于方法实施例，所W相关之处参见方法实施例的部分说明即可。 [014 lead to the device or system embodiments, since the respective portions of the basic embodiment Referring embodiment, the correlation W from the method in method embodiments. W上所描述的装置或系统实施例仅仅是示意性的，其中所述作为分离部件说明的单元可W是或者也可W不是物理上分开的，作为单元显示的部件可W 是或者也可W不是物理单元，即可W位于一个地方，或者也可W分布到多个网络单元上。 Example W apparatus or system described herein is merely illustrative, wherein the separating member as described W unit may be or may not be physically separated from W, as the display unit components may be or may be W W not be physical units, W can be located in one place, or W may also be distributed in multiple network units. 可W根据实际的需要选择其中的部分或者全部模块来实现本实施例方案的目的。 W may be selected according to the actual needs of part or all of the modules to achieve the objectives of the solutions of embodiments. 本领域普通技术人员在不付出创造性劳动的情况下，即可W理解并实施。 Those of ordinary skill in the art without creative efforts, W can understand and implement. 在本发明所提供的几个实施例中，应该理解到，所揭露的系统，装置和方法，在没有超过本申请的精神和范围内，可W通过其他的方式实现。  The present invention provides several embodiments, it should be understood that the system, apparatus and method disclosed in the present application does not exceed the spirit and scope of W can be achieved in other manners. 当前的实施例只是一种示范性的例子，不应该作为限制，所给出的具体内容不应该限制本申请的目的。 The current embodiment is only a example of exemplary embodiments and should not be construed as limiting, given the specific content should not limit the purposes of this application. 例如，所述单元或子单元的划分，仅仅为一种逻辑功能划分，实际实现时可W有另外的划分方式，例如多个单元或多个子单元结合一起。 For example, the dividing unit or subunit is merely logical functions, W may be other division in actual implementation, for example, a plurality of units or sub-units combined together. 另外，多个单元可W或组件可W结合或者可W集成到另一个系统，或一些特征可W忽略，或不执行。 Further, a plurality of units or components may be W W W may be combined or integrated into another system, W or some features may be omitted, or not performed. 另外，所描述系统，装置和方法W及不同实施例的示意图，在不超出本申请的范围内，可W与其它系统，模块，技术或方法结合或集成。  Further, the system, apparatus and method, and W is a schematic view of a different embodiment of the described embodiments, without departing the scope of the present application, W may be combined or integrated with other systems, modules, techniques, or methods. 另一点，所显示或讨论的相互之间的禪合或直接禪合或通信连接可W是通过一些接口，装置或单元的间接禪合或通信连接，可W 是电性，机械或其它的形式。 Another point, shown or discussed Zen meditation directly bonded or may be bonded or communication connections between each W is through some interface, or indirect bonding Zen communication link or unit, W may be electrical, mechanical, or other forms of . W上所述仅是本发明的具体实施方式，应当指出，对于本技术领域的普通技术人员来说，在不脱离本发明原理的前提下，还可W做出若干改进和润饰，该些改进和润饰也应视为本发明的保护范围。  W on only specific embodiments of the present invention, it should be noted that those of ordinary skill in the art who, without departing from the principles of the invention, may make various improvements and modifications W, the plurality of improvements and modifications should also be regarded as the protection scope of the present invention. 1. 一种数据处理方法，其特征在于，包括： 获取待处理数据，以及所述待处理数据的信道编码方式； 根据所述信道编码方式，以及预先建立的信道编码方式与调制方式的对应关系确定所述待处理数据的调制方式，所述预先建立的信道编码方式与调制方式的对应关系用于保证对所述待处理数据的进行编码和调制处理后的处理结果按照固定的符号速率进行发送； 根据所述信道编码方式对所述待处理数据进行编码处理，以及根据确定的调制方式对所述待处理数据进行调制处理； 按照所述固定的符号速率发送对所述待处理数据进行编码和调制后的处理结果； 其中，所述预先建立的信道编码方式与调制方式的对应关系中，信道编码方式所对应的调制方式为比现有信道编码方式与调制方式的对应关系中信道编码方式所对应的调制方式阶数高的调制方式。 A data processing method characterized by comprising: acquiring data to be processed, the channel coding scheme and data to be processed; mapping relationship according to a channel coding scheme, channel coding scheme and modulation scheme are pre-established determining the modulation scheme to be processing data, the corresponding relationship in advance a channel coding scheme and modulation scheme is used to ensure the establishment of a processing result of the encoding and modulation of the transmission data to be processed according to a fixed symbol rate ; according to the channel coding scheme for the data to be processed coding processing, modulation processing and the data to be processed in accordance with the determined modulation scheme; and transmitting the encoded data to be processed and in accordance with the fixed symbol rate the processing result of modulation; wherein the corresponding relationship between channel coding scheme and the modulation scheme of the pre-established, the channel coding scheme corresponding to the modulation scheme than the corresponding relationship between the existing channel coding and modulation for channel coding scheme modulation scheme corresponding to a higher order modulation scheme. 2. 根据权利要求1所述的方法，其特征在于，所述根据所述信道编码方式对所述待处理数据进行编码处理的过程包括： 设定所述待处理数据信道编码中的偷比特SB的值为预先为所述信道编码方式中对应的头编码方式分配的预设值。 2. The method according to claim 1, characterized in that, during the process of encoding data to be processed according to the channel coding mode comprises: setting the steal bit SB to be processed in the data-channel coding pre-assigned values ​​for the first encoding of the channel coding scheme corresponding to a preset value. 3. 根据权利要求1所述的方法，其特征在于， 所述预先建立的信道编码方式与调制方式的对应关系中的信道编码方式为高冗余编码方式；所述高冗余编码方式为：对待处理数据编码后得到的输出信息量高于按照现有信道编码方式与调制方式的对应关系中的信道编码方式编码后的输出信息量的信道编码方式。 3. The method according to claim 1, wherein the predetermined correspondence relationship between the channel coding scheme and channel coding scheme in modulation scheme established for encoding high redundancy; the high redundancy coding scheme is: after the treatment information output encoded data obtained above channel coding scheme in accordance with the output information of the channel coding scheme corresponding relationship existing channel coding scheme and the modulation scheme in the coding. 4. 根据权利要求1或2所述的方法，其特征在于， 所述预先建立的信道编码方式与调制方式的对应关系中的信道编码方式为低冗余编码方式，所述低冗余编码方式为：对待处理数据编码后得到的输出信息量低于按照现有信道编码方式与调制方式的对应关系中的信道编码方式编码后的输出信息量的信道编码方式。 4. The method of claim 1 or claim 2, wherein the channel coding scheme corresponding relationship between the channel coding scheme and the modulation scheme for the pre-established low redundancy coding, the low redundancy coding scheme to: output information amount after treatment is lower than the coded data obtained in accordance with the output of the channel coding mode information after channel coding scheme corresponding relationship existing channel coding scheme and the modulation scheme in the coding. 7.-种数据处理方法，其特征在于，包括： 接收网络侧按照固定的符号速率发送的处理结果； 依据所述固定的符号速率，通过调制方式盲检测判别出所述接收到的处理结果的调制方式； 利用所述调制方式对所述处理结果进行解调； 其中，所述依据所述固定的符号速率，通过调制方式盲检测判别出所述接收到的处理结果的调制方式的过程包括： 将所述处理结果按照所述固定的符号速率，分别进行不同调制方式的处理流程，得到不同的流程结果； 利用预设的判别准则，对所述流程结果进行分析处理，确定所述处理结果的调制方式。 7.- kinds of data processing method characterized by comprising: receiving a network-side transmits the processing result according to a fixed symbol rate; according to the fixed symbol rate, the modulation scheme through a blind detection process discriminated result of the received modulation; with the modulation of the demodulating processing result; processes wherein the fixing according to the symbol rate, the modulation scheme by the modulation scheme blind detection is determined that the received processing result comprises: the process according to the result of a fixed symbol rate, the processing flow respectively different modulation methods, different processes results obtained; using a predetermined criterion, the results of flow analysis and processing, the processing result of determination Modulation. 8. -种数据处理设备，其特征在于，包括： 获取模块，用于获取待处理数据，以及所述待处理数据的信道编码方式； 调制方式确定模块，用于根据所述信道编码方式，以及预先建立的信道编码方式与调制方式的对应关系确定所述待处理数据的调制方式，所述预先建立的信道编码方式与调制方式的对应关系用于保证对所述待处理数据的进行编码和调制处理后的处理结果按照固定的符号速率进行发送；其中，所述预先建立的信道编码方式与调制方式的对应关系中，信道编码方式所对应的调制方式为比现有信道编码方式与调制方式的对应关系中信道编码方式所对应的调制方式阶数高的调制方式； 编码调制模块，用于根据所述信道编码方式对所述待处理数据进行编码处理，以及根据确定的调制方式对所述待处理数据进行调制处理； 发送模块，用于按照所 8. - kind of data processing apparatus, characterized by comprising: an obtaining module, configured to obtain data to be processed and the channel coding scheme of the data to be processed; modulation mode determining module, based on said channel coding scheme, and corresponding relationship between channel coding scheme and the modulation scheme determined pre-established modulation scheme of the data to be processed, the predetermined relationship corresponding to the channel coding scheme and modulation scheme for ensuring the establishment of encoding and modulating the data to be processed the processing result of the processing transmitted according to a fixed symbol rate; wherein said predetermined correspondence relationship between the channel coding scheme and the modulation scheme is established, a channel coding scheme corresponding to the modulation scheme than the conventional channel coding scheme and modulation scheme high corresponding relationship between channel coding manner corresponding to the modulation order of the modulation scheme; coding and modulation module, for performing encoding processing on the data to be processed according to the channel coding scheme, and according to the determined modulation scheme to be the performs modulation processing on data processing; sending module, configured in accordance with the 固定的符号速率发送对所述待处理数据进行编码和调制后的处理结果。 A fixed symbol rate of the transmitted data to be processed is processed result of coding and modulation. 9. 根据权利要求8所述的设备，其特征在于，所述编码调制模块包括： SB值设定单元，用于设定所述待处理数据信道编码中的偷比特SB值为预先为所述信道编码方式对应的头编码方式分配的预设值。 9. The apparatus of claim 8, wherein said modulation encoding module comprises: SB value setting means for setting the steal bit SB to be processed in the data-channel coding as the pre-value dispensing preset values ​​corresponding to the channel coding scheme encoding head. 10. -种数据处理设备，其特征在于，包括： 接收模块，用于接收网络侧按照固定的符号速率发送的处理结果； 调制方式判别模块，用于依据所述固定的符号速率，通过调制方式盲检测判别出所述接收到的处理结果的调制方式；其中，所述依据所述固定的符号速率，通过调制方式盲检测判别出所述接收到的处理结果的调制方式的过程包括：将所述处理结果按照所述固定的符号速率，分别进行不同调制方式的处理流程，得到不同的流程结果；利用预设的判别准则， 对所述流程结果进行分析处理，确定所述处理结果的调制方式； 解调模块，用于利用所述调制方式对所述处理结果进行解调。 10. - kind of data processing apparatus comprising: receiving means for receiving a processing result sent by the network according to a fixed symbol rate; modulation discrimination means for fixing according to the symbol rate, modulation method blind detection of modulation processing result discriminated said received; processes wherein the fixing according to the symbol rate, the modulation scheme through a blind detection process discriminated result of the received modulation scheme comprises: the said processing result according to said fixed symbol rate, the processing flow respectively different modulation methods, different processes results obtained; using a predetermined criterion, the results of flow analysis and processing, the modulation mode of the processing result ; demodulating means for demodulating the processing result using the modulation scheme.